Bouquet Subscriptions are the perfect way to enjoy farm fresh flowers all season long! Subscriptions are usually purchased in the winter/early spring to help us get a head start on the season and are available for both individuals and businesses. They are also the perfect gift for a special loved one or yourself! Nothing brightens up a home, office space, classroom, restaurant or shop better than fresh cut flowers! We also have beautifully designed gift certificates available at no extra cost! Our Bouquet Subscriptions will run from June through to October. Subscribers will pick up their bouquets each week from either our farm in Ruthven or at the Downtown Windsor Farmer’s Market on Saturday's. If for some reason, you cannot get your bouquet, you can gift that bouquet to a friend who can pick it up in your place. Also, for those interested, delivery is available for an extra fee. Connect with us to discuss. Our bouquets are thoughtfully designed to reflect the beauty and uniqueness of each season. We have four Bouquet Subscription options for you to select from below. New to 2019! We are offering Mason Jar Subscriptions for those who prefer a ready to go arrangement! Contact us to purchase a Subscription today! Subscriptions are limited so act quickly! We can’t think of a more exciting time for flower lovers. The snow has long melted and the dark, rich soil is bursting with new life. But most importantly, the peonies are blooming! In the Spring/Early Summer Bouquet Subscription you will find the best of what the new season has to offer. Foxglove, delphinium, poppies, and of course, peonies! This subscription will run from June 8th to July 13th. New to 2019! The Spring/Early Summer Mason Jar Subscription will include the more delicate spring blossoms that you might find in your grandmother’s garden. Heavenly scented lily of the valley, delicately draping bleeding heart stems, late blooming tulips, peonies and more. Each week, this subscription comes arranged in a 500mL mason jar, so arrangements are the perfect size to brighten up your desk, kitchen island or coffee table! The field is overflowing with so much beauty in late summer and some of our absolute favourites are coming on strong! Dahlias, sunflowers, zinnias and lots of textural grasses are all in abundance and waiting to be shared. In the Late Summer Bouquet Subscription you will receive a weekly selection of the best of what the season has to offer! This subscription will run from July 20th to August 24th. New to 2019! The Late Summer Mason Jar Subscription will be filled with all the colours, textures and scents of summer! Smaller, more delicate varieties of sunflowers, zinnias, nigella, dahlias, queen anne’s lace and many more will be arranged in 500mL mason jars each week for you to enjoy from July 20th to August 24th. As the days get shorter and the strength of Essex County’s heat begins to dwindle the field is able to relax and put on its final show. The dahlias will be blooming abundantly, as will the celosia, zinnias, strawflower, sage and more. 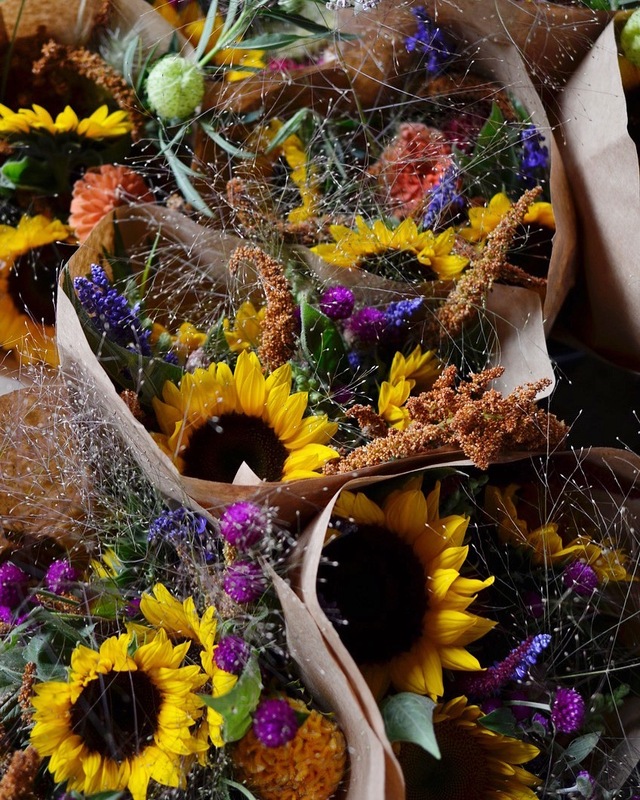 The Autumn Bouquet Subscription will run from August 31st to October 5th. The Autumn Mason Jar Subscription is the perfect way to celebrate the end of summer. The dahlias and sunflowers will be blooming abundantly and we’ll have tons to share with you! Warm harvest tones and textures, bright yellows and magentas, the rich colours of autumn are truly something to celebrate! This subscription will run from August 31st to October 5th. 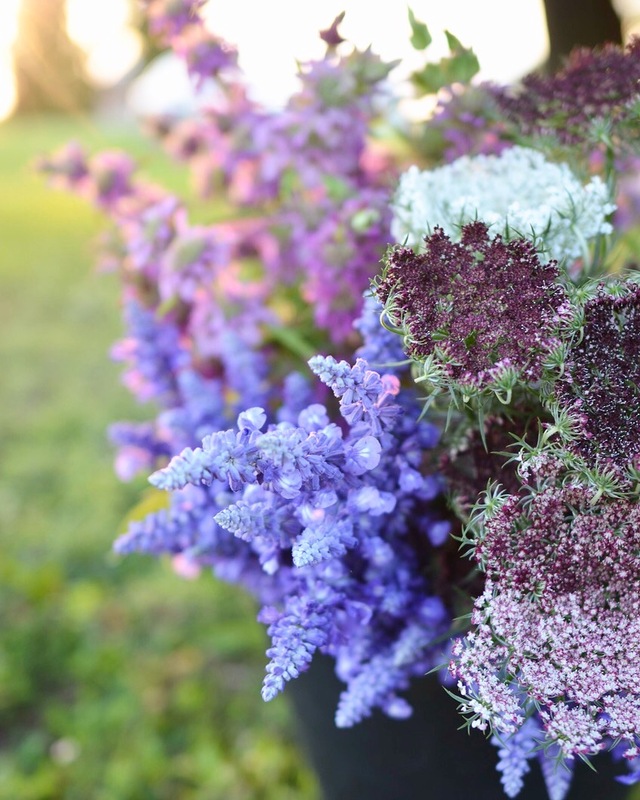 Enjoy farm fresh flowers all season long with this luxurious subscription! Each week from May 25th through to October 5th we will harvest armloads of field grown blooms and create artfully arranged, seasonally inspired bouquets to fill your home, office or business! Starting in spring with favourites like peonies, sweet peas, nigella, and delphinium… We will then have rows filled with sunflowers, snapdragons, and larkspur carrying us through to late summer/autumn. Which is when the dahlias burst into bloom and the field (+ our vases) are filled with incredible colour! We hope you will join us and support locally grown flowers! And of course, thank you so much for the many ways you support and encourage our farming adventure! *Payment is non-refundable and total payment should be received to reserve your Bouquet Subscription. Pick up location and dates will be confirmed Spring 2019, but will be available in both Ruthven and Windsor, Ontario. Sign up and receive our monthly newsletter that is filled with helpful growing tips, special offers, farmer stories and exciting announcements!